Hexbug has been all the rage ever since we introduced our son to the little critters a few years ago. If you don't know about them, Hexbug are robotic insects that simulate the real thing, except that you can turn these bugs off whenever you want and you don't have to worry about them infesting your home! There are different types like the Hexbug Spider which is controlled with a mini remote control or some go on their own like the Hexbug Nanos. You can also get playsets like arenas, let them go and watch the laughter. Lots of fun for all ages. Now, not only can you collect Hexbugs but you can also build them with new Hexbug VEX Robotics! Geared for kids aged 8+, Hexbug VEX Robotics is a build-it-yourself robotics kit that allows your child to get a hands-on experience and build their very own jumbo sized, working Hexbug! Hexbug VEX Robotics fosters creative STEM learning through this new, hands-on experience. Not only can your kids build a Hexbug but they can also program its controls. To create a Hexbug VEX Robotics Ant, little engineers start by assembling the six red wheels and attaching the motors and wheels to the ants core. Once the base is in place, the brain and sensors are connected and the bright red outer body pieces are attached to give the robot its flair and make it a real Hexbug Ant! To finish off the Hexbug VEX Robotics Ant, wiring the brain to the dual bump sensors and the two motors using snap connectors. Programming is simple as kids just flip a series of switches on the robots brain which allows them to play with different settings and different modes. There are 64 different programming variations to choose from so no two Hexbug VEX Robotics Ants are the same! There are also three drive modes: Standard driver mode where your child controls the robot with its remote control, Autonomous where the robot navigates itself its sensors and "Crazy" Autonomous which simulates the real, random wanderings of nature! The Hexbug VEX Robotics Ant includes more than 50 snap together parts and requires both 3 AAA batteries and one 9 volt battery to operate. Batteries not included. 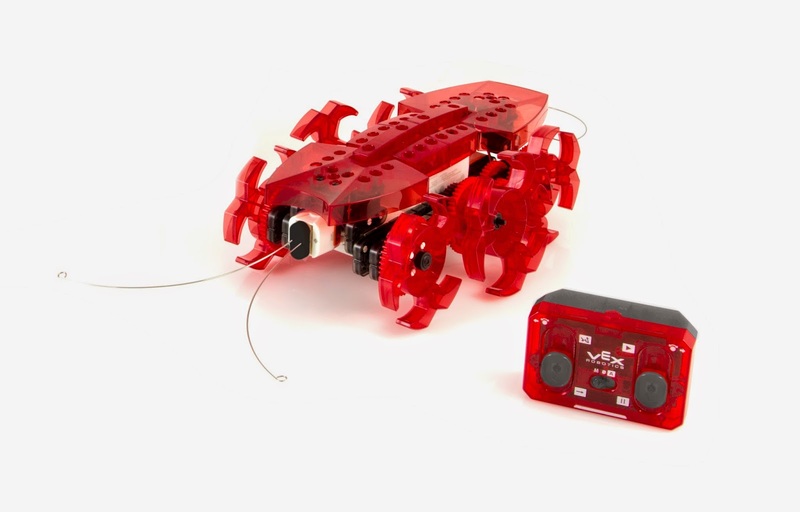 Other Hexbug VEX Robotics kits include the Scarab, Spider and Strandbeast! These can be as fun for adults as kids too, if you have someone in your family who loves to build things. It makes for a great parent-child learning adventure. I would definitely recommend this as a gift idea for the young engineers on your holiday list this year. Hexbug VEX Robotics and other Hexbug robots can be found at local toy stores like Toys R Us and Mastermind Toys between $49.99 - $89.99 depending on the model. Learn more about new Hexbug VEX Robotics by visiting the website! Posted on behalf of Innovation First. Complimentary product was received for review purposes. Opinions and comments on this blog are honest and those of the author. coworker who had been dking a lttle research on this.